Hide this Project (Imperia The Esfera) Discover properties in other projects by hiding the ones that doesn't interest you. You won't see them in your searches further but you can unhide anytime later. Hide this Dealer (CHETAK ESTATE)Discover properties by other dealers by hiding those whom you have already spoken to. You won't see them in your searches further but you can unhide anytime later. Hide this Dealer (Prop Advise)Discover properties by other dealers by hiding those whom you have already spoken to. You won't see them in your searches further but you can unhide anytime later. Hide this Dealer (Space Finders)Discover properties by other dealers by hiding those whom you have already spoken to. You won't see them in your searches further but you can unhide anytime later. Hide this Dealer (Teena Properties)Discover properties by other dealers by hiding those whom you have already spoken to. You won't see them in your searches further but you can unhide anytime later. Hide this Dealer (NGLC Realtech Pvt Ltd.)Discover properties by other dealers by hiding those whom you have already spoken to. You won't see them in your searches further but you can unhide anytime later. Hide this Dealer (Prasidhi Realty Solutions)Discover properties by other dealers by hiding those whom you have already spoken to. You won't see them in your searches further but you can unhide anytime later. Hide this Dealer (The Property Experts)Discover properties by other dealers by hiding those whom you have already spoken to. You won't see them in your searches further but you can unhide anytime later. Hide this Dealer (Ashok Nandle) Discover properties by other dealers by hiding those whom you have already spoken to. You won't see them in your searches further but you can unhide anytime later. Imperia Structures is proud to present Imperia The Esfera, an urban project of 8 limited edition towers. Located on Sector-37C in the elite Gurgaon. The property offers home has 2BHK, 3BHK and 4BHK apartments and comes fitted with best-in-class features, specifications with all the basic amenities to facilitate the needs of the residents. The flats are truly deluxe and unique, the kind of premium property one will be proud to have. This complex gives an ideal option for the residents looking for an abode in Gurgaon. Sector-37C, is a planned locale in Gurgaon. The residential projects are strategically located so that traveling and accessing commercial zones is hassle-free. With a number of developed localities, it is topping the chart of the home buyer preferences. Where is Imperia The Esfera located? The project is located in Sector-37C, Gurgaon. What size of flats are available in Imperia The Esfera? The apartment sizes in the project vary from 1435.0 sqft to 2600.0 sqft. 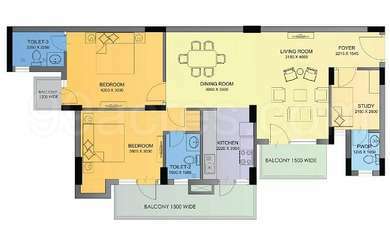 What is the area of 2 bhk in Imperia The Esfera? The size of a 2BHK unit in the project ranges from 1435.0 sqft to 1578.0 sqft. What is the 3 bedroom size in Imperia The Esfera? The area of 3BHK units in the project varies from 1650.0 sqft to 2035.0 sqft. What is size of 4 bhk in Imperia The Esfera? The area of 4 BHK apartments ranges from 2400.0 sqft to 2600.0 sqft. What is total size of Imperia The Esfera?The project is built over an area of 40.0 Acres. At Imperia Group, we believe in dreams, and in turning each into a stunning reality. Imperia has been a part of the incredible transformation that changes the real estate landscape. Be it commercial, office, residential or retail, we have created archetypes of excellence in every space. tancy services ? Citibank, Reliance, Siemens, Diesel, L&T, Voltas, Videocon, Blue Star, GE Money, Snapdeal, Airtel, Kotak, TCS, Samsung, Flipkart, Maharaja Whiteline, Max Bupa among others. Hi I am planning to invest in Imperia The Esfera. I will be moving with my 10-year-old daughter, what all facilities are available for kids in and around the society. Hi Sidharth! The project has very low occupancy rates with only 10-12 families staying here. So, please keep that into consideration. Also, 37 C is a remote area and not fairly well-connected to rest of the city through public transport. So, safety could be a concern here. Hi Sidharth! Imperia The Esfera has a separate childrens play area, badminton court, basketball court, lawn tennis court, multipurpose court, swimming pool among others. Also, it is a gated society with guards at the main gate as well as at the entrance lobby along with the provision of video door security thereby making it safe for your kids. Project is good as per the price range offered by the builder and in resale as well. After dwarka expressway gets fully operational,, then there will be good appreciation in future. All amenities are available inside society. Is Imperia The Esfera a good project to invest in? Hi Naman! There has been no change in prices in sector 37C, Gurgaon in the last 2 quarters. However, Imperia the Esfera has shown a depreciation of 6% as compared to the last quarter. This could be because of over ambitious asks by some underwriters and owners. I have also read online that the residents are complaining about the size of the room and the open area. There are many new projects coming up on the Dwarka expressway stretch, which will further hamper the prices. Thus, I would recommend you to consult a realty expert before finalizing any investment.